**Difficult for some kids and adults. See note below. Wisconsin is home to many bike trails, including a number of "rails to trails" off-road bike paths that have been developed on unused railroad beds. 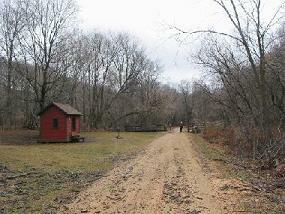 One of the most famous of these trails is the Elroy-Sparta trail. This bike trail is on the old "400" railroad path named after the trains that would travel from Chicago to Minneapolis on this path in 400 minutes. What makes this bike trail a favorite is the three railroad tunnels that the bike path goes through. The third tunnel (Tunnel No. 3) just north of Norwalk, WI is the most distinctive. It stretches for three-quarters of a mile and, although straight, one usually cannot see the other end of the tunnel until half way through. Those not afraid of the dark walk through the tunnel without a flashlight for a fun experience. Adding to the eeriness are drops of water coming from the natural springs that the tunnel passes underneath. Those not wishing to get a little wet might bring an umbrella. The tunnel has been called "the largest man-made air conditioner" due to the cooling effect it has on the air around it. The cold air coming from the tunnel can be felt on the bike path even before the tunnel can be seen. This is often a welcome change on a hot Wisconsin summer day of biking. The clues are designed for those letterboxers that wish to walk the bike trail to the letterbox. If you wish to bike the trail, go to the trail beginning in Sparta, WI to purchase a trail pass and start your ride. The bike trail, although mostly flat, goes slightly downhill from Sparta to Elroy. If bikers do not wish to bike back to Sparta, they can get a ride back to Sparta from just about any town on the trail. The trail is open year-round for hikers, but the tunnel is usually only open during the day between May 1 and October 31 (when the trail is open for bikers). If you are searching for the letterbox outside this timeframe, there IS a way to get to the box without going through the tunnel, but you'll have to discover that on your own ; ) ! From the east side of Sparta, go to the intersection of Hwy 16 and Hwy 71. Take Hwy 71 south 7.9 miles to Kenya Road on the east of the road (the road after Keel Road on the west side). Kenya Road is easily missed, as it slopes down the hill Hwy 71 begins to climb at that point, so watch carefully. As you travel Hwy 71, you can see the bike trail to the west from time to time. As you exit Hwy 71 onto Kenya Rd. you will see a trail access gate on your left. You can park here as long as you don't block the gate. Walk to the bike path and travel south on it (away from Hwy 71). (Please be nice to the bikers and stay to the side of the trail.) You'll know you're getting close to the tunnel as the temperature changes. Once you reach the tunnel, walk right through it to the other end (preferably without a flashlight or umbrella). At the other end of the tunnel, stop to re-orientate yourself, and to read the information sign about the tunnel. You are very "hot", but you need to get "cold" before you can be even "hotter". Continue on the bike trail away from the tunnel another 700 paces. You will then find yourself in the middle of a hidden park on the bike trail (if you are biking the trail, you can leave your bike here for a while). Spend some time reading about the history of the railroad line and the tunnel as you hunt for a place to sit in the park if you "love to be biking". Once sitting in this spot look to your left for a small brown sign across the bike path from you. Go to this sign and view the object it talks about. ***Note: From here on the trek is difficult and not really for kids (although I take kids here regularly). Depending on the season, be ready for slippery ice or lots of bush-whacking! If you feel unsafe, don't do this box. Walk along this object on a heading of 276 degrees past two bridges and into the woods. Hop onto the stone wall and continue walking (carefully!) on the top of the wall through the woods until the wall ends (you can walk on the woods-side of the wall (although it is more difficult) if walking on the wall doesn't suit you). Once at the end of the stone wall, you'll find a barbed-wire fence. Continue through the woods keeping this fence to your right. (Note: near the beginning of this fence a number of trees have fallen and you'll have to circumvent them and come back to the fence up a small hill.) After a short hike, you'll find that you have retraced your "700 paces" and have become very "warm". Survey the area and find a way to carefully climb down so you are above the spot were the bikers start walking their bikes. Wave to any bikers under you. There are five stumps along the edge that have had their trunks cut off. Find the middle stump (you're very hot!). Under its roots, covered by some stones and leaves you will find the letterbox. After stamping-up, retrace your path back to your car.